Fall crafts aren't complete without at least one cute turkey craft for kids! Those feathered friends are a staple of fall and Thanksgiving celebrations. Make a bunch to decorate your holiday table with or just to add a dash of cuteness to your home! Using fall colored markers, let your kids color six craft or popsicle sticks. These will be your turkey feathers! We used red, orange, yellow, and brown markers to make our feathers. Use a glue gun to glue the popsicle sticks together in a fan shape. You can also use a tacky glue, just make sure you put something heavy on the end where they are glued until glue has dried. Once you have finished gluing together your turkey feathers it's time to cut out the other parts of your turkey craft. You will need a small red piece of construction paper for your turkey's snood and an orange piece to cut your beak and legs from. You also need to cut two circles, one slightly smaller than the other, from brown construction paper to be your turkey's body. Next get your glue out and glue on your turkey's body, eyes, beak, snood, and legs. If you have little kids I recommend using glue sticks but older kids can easily dab a bit of glue on. Want your turkey to be a cute centerpiece for your table? We added another popsicle stick to the bottom of our turkey craft to turn it into a centerpiece. 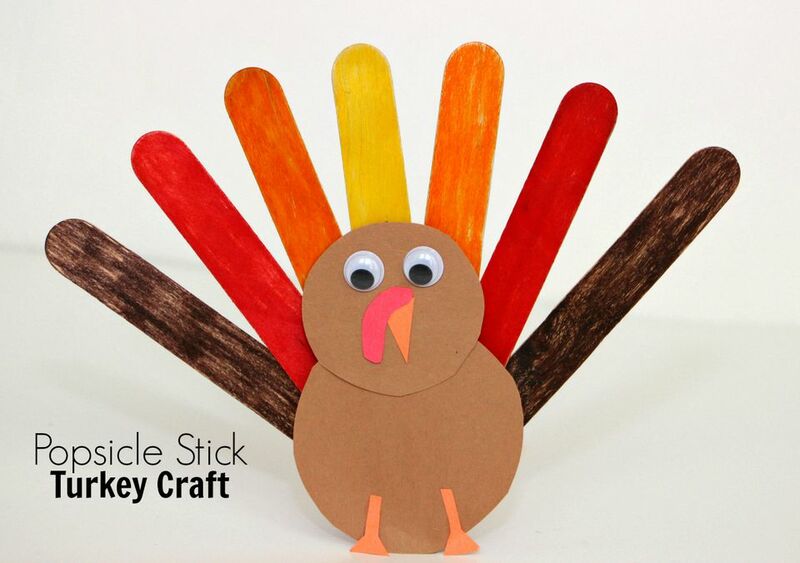 Simply attach one end of a long craft/popsicle stick underneath the bottom of the turkey's feathers with hot glue. This enables your turkey to stand upright! Gobble, gobble! This popsicle stick turkey is so cute and it's a perfect handmade centerpiece for your fall or Thanksgiving table! Make it today!